Trash cans scattered across the vacant lot across the street. Unfortunately our trash man didn’t show until the next day and trash bags were scattered all over the neighborhood and filled our lake. Our trash can? Broken fence. Our house is the one in the middle across the street. This one is a little extra bent. So glad the kids were there to help. We think this is the tornado that devastated Harvest.. just a ways north of us. House under construction on the other side of the lake. Notice the stop and street signs? Power lines between us and the grocery store. Our lake from our back porch. We had a little ran. Flooded up to the neighborhood gazebo. The tornado that came by our house started in the far corner of the lake between the gap in the trees. The big tree to the right of the gap has quite a bit of damage. 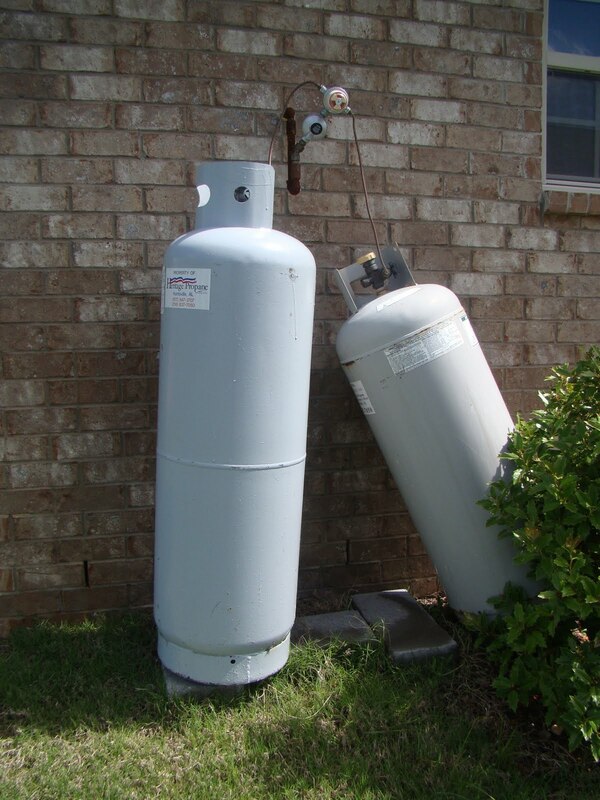 Our propane tanks need a redesign. I think they should be underground. We didn’t notice them until the next morning. Zoë likes the new hole in our screen door. After some hammering we were able to get it to close again. Neighbor’s roof was pretty torn up.. I am guessing by our patio furniture. The glass from our table was scattered all the way to the sidewalk. I should get out there with the shop vac now that we have power. The house across the street took some abuse, and that white frame used to hold a fence.